How’s the Google Penguin Treating You? On April 24th, Google rolled out their “Penguin” update. Mass chaos has ensued in the SEO world, with much debate among the Internet marketing community. Out of all the Google updates I’ve seen over the years, this one seems to have caused more anger and frustration than the others. So I figured I’d weigh in on the issue. I’ve read numerous complaints around the web regarding the vagueness of Google’s explanation. Those seem to mostly be from SEO marketers who are making excuses for why their (and their clients) sites have fallen in the rankings. They say Google isn’t being clear enough, and isn’t revealing the details of the algorithm… which “isn’t fair”. However, I think Google has given us plenty of information over the years about what they like and don’t like. They don’t like efforts to manipulate search results. They don’t like spam. They don’t like low quality content. Pretty basic stuff, right? Therefore the Penguin update shouldn’t come as a shock to anyone. It’s basically an enforcement of what Google has been preaching over the past several years. Now, before anyone labels me as a Google-hugger, or a pious white-hat puritan, let me explain where I’m coming from. The majority of my traffic for most of my websites does not come from SEO. I decided a long time ago that SEO was not going to be my primary traffic strategy. I didn’t want to be dependent on Google, and I didn’t want to invest my time in the ever-changing SEO game. In my Internet marketing lessons, I teach five main categories of web traffic generation. SEO is just one of those categories. I don’t have any SEO clients, and I’ve never sold any SEO products (although I have promoted several as an affiliate). I’ve always held the viewpoint that Google does not own the Internet, nor do they have the right to exclusively define morality. Google is not God. Therefore I’m not inherently anti-blackhat. If what you’re doing is LEGAL, and doesn’t hurt anyone, that’s your prerogative. Google built their business in part by “scraping” the web. An argument can be made that they took everyone’s content (without permission) and used it to build a search engine. When you do a search on Google, you’re not actually searching the web. You’re searching stuff that has been stored on Google’s computers. Business is a war of sorts, and if your opinion is that gaming Google constitutes fair competition, so be it. At the same time, I’ve held the viewpoint that Google does own Google, and they DO have the right to define their own ethics and to dictate how their search engine is used. For that reason alone, I’m not a proponent of blackhat. I figure if you want to get web traffic from Google, why not work with them instead of against them? Perhaps equally important, I believe that Google is smarter than me. Not better. Not wiser. But smarter. I’ve never written a single line of code for a search engine algorithm, let alone create the most sophisticated one on the planet. I’ve never built a car that can drive itself (as Google has done), or built a multi-billion dollar company. So I’ve always had a feeling that Google would eventually outsmart the blackhatters. Perhaps the Penguin is a partial manifestation of that eventuality. I say “partial” because clearly there’s still a lot of spam at the top of the rankings. For example, my previous blog post was a product review of a product called “One Minute Commissions”. Since my review is one of only a handful of unbiased reviews that I’ve seen, I would have hoped to see it near the top of the results for the search term one minute commissions review. However, the ENTIRE first page and most of the second page of results are populated by bogus reviews (ie. reviews intended only to promote the product). On the other hand, I’ve seen mostly positive changes in my own results since the Penguin update. For example, this Eric’s Tips website is currently ranking better for some of my keywords than it was before Penguin. 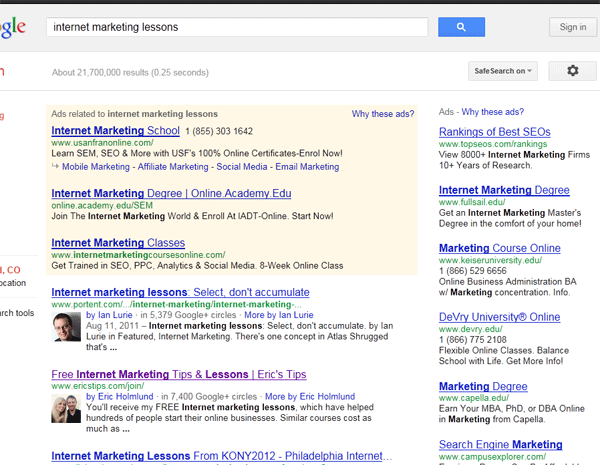 For example, I’m now ranking #2 for internet marketing lessons. I’m also #5 for internet marketing tips, and #6 for free internet marketing tips. Certainly nothing to brag about, but those are all improvements by about 5-10 ranking positions. I see this as a successful implementation of Google’s attempt to “reward high quality sites”. I’ve never done any spammy link building with this site, and have done a minimal amount of SEO. I believe the sites that were previously above mine have been penalized for spammy practices. 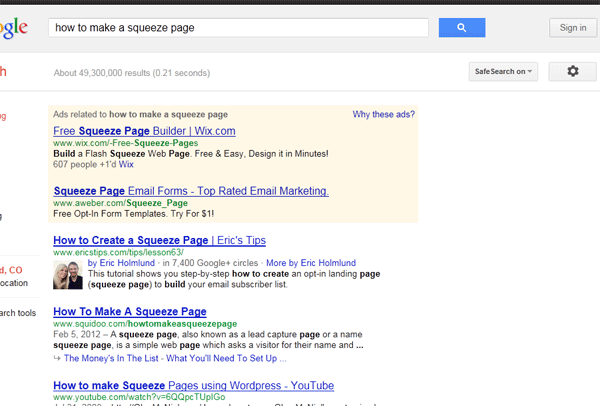 I’m ranked #1 for how to make a squeeze page, even though that particular phrase is NOT found anywhere on the page (the page is also ranked #1 for how to create a squeeze page, and #8 for squeeze page). It’s a relatively new site, on which I’ve done no SEO, and I’m ranked #1 out of 439,000,000 results for clean movies. For a long time, those who teach SEO (including myself) and those who practice it have said that off-page SEO is synonymous with link building. Indeed, links are the measure of authority. However, Google never said to go out and GET a bunch of links, or to MAKE a bunch of links. I don’t mean for this to sound like “I told you so”, but even while I was teaching about link building I was warning that Google COULD at any time negate the value of entire genres of back links. Remember, Google is smart. And really it doesn’t take much intelligence to see what Internet marketers have done with article marketing, social bookmarking, blog networks, directories, etc. There has been much speculation that Google is now penalizing links that they deem to be spammy. Not just discounting those links, but actually penalizing them. Whether it’s true, I don’t know, but the potential ramifications are huge. If it’s true, you could literally take out your competitors by spamming on their behalf. Those spammy links are so easy to acquire that this would absolutely become a reality. IF it’s true, I’d also be willing to bet that there will be more big changes in the future for Google’s algorithm. Remember, Google is smart. If backhatters start sniping their competitors websites by spamming, Google will figure out a way to combat it. Many prolific SEO experts are actually recommending that you seek to remove all questionable back links. An un-back-linking campaign if you will. In my opinion, that may be a waste of time. I really hope Google will give us a confirmation of whether “bad” links are merely being discounted (in which case you can ignore them), or if they’re truly being penalized (in which case you would need to get them removed). – Avoid spammy back links. – Avoid spun content & other low quality content. – Do get legitimate back links from methods like guest blogging. – Do create great content. He asked some very pertinent questions about link building, and the variety of answers gives a nice balance of viewpoints. Thanks Eric for the post. Very helpful as usual. I have a blog that got hit by the Penguin update and I think it is because I used SEOLinkVine to put content on it. I have a question for you. Should I spend my time and clean up those posts that were from SEOLinkVine (delete the posts or at least the links from them) or is it useless. I have started to write my own blog posts again (even though this is just a little hobby site and not my focus) and I noticed my traffic is always about 10X as much when I post so I will keep doing that…. If you have any advice regarding the other posts please let me know. I have heard what you are saying from others and I agree re a variety of backlinks. However, HOW do I get rid of backlinks that an SEO co. created for me on their article /blog networks? As far as I know that’s impossible, they certainly are not going to do it. Also since the blog network has been de-valued already, is it really even necessary? Would any of the following help those of us who were slapped hard by the penguin? *** Re-naming all our pages, properly spinning or re-writing the content and pinging and/or submitting to google’s url submission page and/or creating a new sitemap? *** Moving our sites to a whole new page (like in my case moving it from an html/css site I built, over to WordPress, with all new page titles etc.? *** And if I did either of the above is there any chance google would hate me for it? *** Any other ideas? Eric? Anyone? So far I have just taken the advice of some SEO experts and am waiting to see if Penguin adjusts itself, but based on what I have learned about it so far, I am skeptical that waiting any longer will be advantageous. I have a hard time recommending anything else, because AWeber is well worth it. For smaller lists, you could host it yourself on your own domain. I use the Amember script to manage most of my membership sites, and it also has list management built in. I do send out emails that way sometimes. Yes Wordtracker is a good keyword tool. I think the jury is still out on whether it would be beneficial to attempt to remove back links from blog networks. My *hope* (even though I haven’t used any) is that it would not be necessary to remove the links, and that Google would only discount them rather than penalize them. As far as Google is concerned, I don’t think they consider there to be any right way to “spin” content. It’s a tough call as far as what action to take. They want everything to be “natural” and if you suddenly move your site to another domain, or suddenly change all the pages on your site, I think that could cause suspicion too. I’m really not sure, as I think the jury is still out on this issue. But since it’s your own blog, I think it would not hurt to clean up the posts or at least take the links out of them. WOW all those years ignoring SEO seem to have finally gone my way! This is a revolving issue as Black hatters and Goggle do their merry dance. Like it has been about all along, good quality content will most of the time. Concentrate on what you write not how you write it! Nice article mate, Thanks a Bunch. Hi Eric! Glad to see you again. The latest zoo full of G updates gave me the motivation to change my direction and be more true to myself. That said, I was surprised to see increased traffic on a few sites I was ready to dump in my renewed focus. Looking at them, I can guess that their survival and upsurge was because of good structure vs grey hat SEO ( they are xcitepro sites) and perhaps some nakedness. All are easily traceable back to me. Maybe Matt is listening to The Who these days. Eric, you’re probably right: anything one tries to do that is not “natural” to fix the Penguin slap may cause further problems, at worst and at best not help. As for spinning content I think there is a fine line between spinning content and re-writing it. You can use a spinner to make re-writing faster and if you go through and make sure it’s all good grammar and everything I don’t see how Google or anyone else could penalize you for that. Technically you can rewrite even something someone else wrote if it’s different enough and in this case I’m talking about re-writing my own content. I’m still waiting to see if I can get my site back to the top by adding more content and more “natural” (?) backlinks. I know some people are using mailchimp with some success. What I’ve heard said is that if your list is not too big you can use mailchimp. But then I think Eric said that if you do something like that, you can’t later transfer your list to aweber? Is that correct, Eric? Paul, I think your second paragraph is the most telling information on the Penguin. If quality sites that appear natural in the “eyes of Google” are all rewarded with high page rankings, then, maybe, the click through rate of adword campaigns decrease and Google’s revenue suffers. Maybe having some spammy sites on page one actually improves the click through rate on adword campaigns, and, thus Googles bottom line. Maybe Penguin is more about improving the experience of Googles paid advertisers with greater click through traffic. Thank you Eric. As always, your posts are very informative and thought provoking. That’s right, Aweber is pretty strict about importing lists. And in the cases where they do allow a list to be imported, all the subscribers have to confirm their opt-in again. AWeber is my top pick, but I would also say that it’s better to be building a list than not. In other words, any platform is better than none. So do what will work for you. There has definitely been speculation that Google is intentionally lowering the quality of their results in order to increase Adwords CTR. They’re also sophisticated enough that they could employ such a strategy on a per keyword basis. In other words, they could deliver good quality results most of the time and bad results on certain searches. I would hope it’s merely a myth. Thanks for this post. It always boils down to the fact that if you do what is right and true you are rewarded. I write from the heart with original material and my sites were not penalised. There are too many software products out there that cheat. Wonderful post. I believe like good content as you write often in your blog:). Yes I’m not exagerrating and we all know that webmasters were playing all nasty tricks to get high rank in google. Jim, Penguin penalized sites with over optimized backlinks. In other words, sites that have overused exact match keywords in their anchor text. It’s really that simple. Penguin has nothing to do with content. It’s not about link sources or low quality sites. It’s about link variation. The one thing I wouldn’t do is remove links or change anything. If you do, you’re just admitting to Google that your doing something they don’t want you to do. You just have to not panic and move forward. I would start by increasing your “naked link” – Links that use your url, with and without the “http” and with and without the “www”. Create short videos and syndicate them out to youtube and other video sites. Use generic links like “click here”, “go to my website”, etc. Use these on low quality sites because the have no SEO value but will add to your cloud cover. Use partial match links. If “dog training” is a keyword, use something like – “the best dog trainer”. Google still sees your keyword. Very these but make them look like a natural sentence. And keep using exact match links as before, just remember the key is variation! Good luck Jim. Hope this helps. I think you hit the nail on the head Rick! As soon as the recent Google algorithms became live there was a rush of so-called experts preaching doom and offering magical ways to get round the ranking effects and continue tricking Google. For example, I have seen websites offering to sell everything from WordPress plugins to expensive tutorials that simple continue to do the things that those product owners have suggested in their sales hype are the cause of falling ranking. More than one website is offering automatic methods of getting hundreds of links every day. That is great for a site like Amazon that already gets many links daily. Google will accept that as being natural. But Amazon will not buy those link offers. They don’t need them. The people who will buy them are the very people who have websites that probably have less than one hundred existing links. So, if they do manage to generate hundreds of links every day what will happen? Google will recognize it as not natural and the ranking will be adversely affected. Where relevant my websites warn people of this problem but I wonder how long it takes for them to accept that doing link building naturally is the route to success. Sales hype can be very persuasive. Thanks for the reply. I’ll look at your list building lessons again (I understand you have a new new list building product coming out soon) and will look forward to your affiliate traffic lessons. It seems to me you have to scramble like crazy to build a significant list and then work to keep that momentum going with consistent attention to the list. Hi there…that will not work either….even if you have a great site in a micro niche you may only ever receive a limited number of visitors who once they have seen the content they wanted have no need to click on to anything, bookmark the site or take any action whatsoever….how can you measure that site…it will have a terrible bounce rate factor but yet the visitor will have seen exactly what he wanted to see ? From my experience aweber are highly unlikely to accept a list transfer from anywhere ! I had several double optin confirmed lists on 1shoppingcart earlier this year i wanted to transfer to aweber. They refused, even after i gave them access to the lists to check them out !!! This is great post. It helped me to understand what is penguin update and how we can stay in the business. A few questions – if aweber is well worth, do you use it?? I was checking out Amember and it seems pretty good but I gather that $179 is only for one license i.e. for one domain. It is a bit expensive for me but if it is really good for membership site and only one time payment then I can consider. However, I will still need list management tool for my other sites. Any suggestion for that? Yes I use AWeber, and have for many years. Yes Amember is per site license. A free alternative to Amember is the Butterfly script that Mike Filsaime released as open source. There are many ways to build your list. Some of them involve scrambling like crazy and some do not. I cover some of these methods in lesson 66 and 67. I have lists that keep building themselves on autopilot. For example, I have products that are promoted by affiliates, and they keep sending traffic. Also this blog draws a decent amount of traffic. New readers find it and subscribe. But list building should always be a priority and I do recommend paying consistent attention to your list building efforts. I have one site that has no backlinks at all and just has lots of comments by viewers and the views have started to skyrocket whereas others that have backlinks have not really done anything much, dropped a bit if anything, so the link building thing could be spot on. It has been a while since I’ve tapped into your lessons and really worked on my own site. You have given me great advice in the past, and so I come to ask you for some more. I’m finally ready to go fulltime into my website and start building it to be the site I’d always envisioned it could be. I have so many lessons stored away regarding link building, traffic building, SEO, etc., that it overwhelms me to the point I give in to despair and don’t progress very far. My instinct tells me to just start building content, really good content that matters to my niche, and let God start blessing it. I think you once said content is king. I think that I need to get tripped up with scads of keyword research and optimization that I just get crippled and don’t write anything. Any words of encouragment or advice? thanks for the info eric, i so like the part – – Avoid spammy back links. – Do make sure back links seem natural. oopps..sorry for the ?? character..must have mistype it. found this which may help. Hi Eric, i cant believe what just happened to our website.We recently had some seo work done , we run a legitement roofing buisness in melbourne australia offering roof repairs and restorations weve paid a company called clixpert over $1000 to work on optimising our site and up until a few days ago were ranked 1st page under a few keywords and 2nd 3rd page ranking under quite a few as a direct result of adding links to pages throughout our site and apparently other back end changes. i feel ripped off as i have just descovered we have ben deranked so far i cant even find our site now.Went back to page 15 and gave up. Up till know weve done all our own work including building the site and running an extensive addwords campaigne targeting a specific region. i am an owner opeator with the help of my wife taking care of marketing and unfortunately it was my bright idea to have seo work done as i recieve alot of calls from internet marketers.Can you please help me with some advise? My wife is going to kill me. Basically yes, you should just start building good content. My caveat (for other people reading this) is if you’re doing this to make money, then you do need to start with a profitable niche. It’s not simply a matter of “if you build it they will come”. I DO think your current niche (large families) has good potential. I took a quick look at your site. I would recommend switching over to the WordPress platform (on your own domain from Godaddy Website tonight, before investing time in building more content. This will be much better for the long term, and will give you more control over your site. Also will enable you to have your blog on your own site instead of blogspot. It’ll be a bit of a pain to rebuild your site on WordPress, but it’ll be much easier to do it now than in the future when you have more content. See lesson #24 for my recommend host. Lesson #33 for explanation of Wordress. You could also outsource the website conversion on a site like vworker. It’s been a really devastating for most of site owners like me. Been at the top for sometime then dropped really hard after the update. I guess right now we just have to press the right buttons when building backlinks..
Great information Eric, I do not have the time to do a lot of SEO and I do put some quality effort into my articles and post. I think this new Google update may help some of the small internet businesses reach top status when Google figures out who is spamming the search engines. Your post was very informative. Thank you. A relative newbie here. I have had fantastic success with a powerful global marketing tool. I had positive results from Penguin which I can only attribute to this marketing tool. I have 4 websites on Google Page One. One site has spot 1 and 2 and 13 positions with longtails ranking on pages 1-4. It is not black hat and it changes to fit the specs of Google. Built by an engineer who wants to help the 97% who make no money. Check it out, it’s worth your time. http://www.globalmarketingtools.com. I don’t have a intelectual prouduct, I have some cold hard facts! I NEED SOME HELP! I do want to live the life I was born to live, and I need somebody to help me because I cannot do it by myself, I’ve tried. Thank you for your question. We recommend that you hang in there with Eric’s free video lessons here at http://www.ericstips.com/. Eric’s lessons have helped many people to go from beginners, to successful online business owners! Hey Eric: I’ve been trying to learn how to become an internet marketer for over 6 years. I still have no idea how to get started. That’s why I joined your free tutoring newsletter. All I want to do is figure our how to make $200 to $250 a day. Then I can quit my job. I made it to lesson 16 and got bogged down. That was almost 2 years ago. I purchased a PLR product from you recently, but I do not know how to personalize it or change anything or even upload it to sell it. Where can I go for basic dummy help?